Thank you to everyone who came to our June shindig at the Central Phoenix Samurai Comics! We had a marvelous evening with games, snacks, and general merriment. If you couldn’t show up to this past shindig, don’t fret! We’re having another one in July! Stay tuned for more information regarding that. In other news, here’s a shameless plug for the CASFS Book Social! At fan tables and anywhere that I (somehow) wind up the expert of Joss Whedon, the most common question I get is "are they ever going to do more with that 'verse?" Well, there are the comics (with a one off this summer by Patton Oswalt called Serenity "Float Out" and the long anticipated "Shepherd's Tale" that we've been waiting for since the Browncoat Cruise in 2007, but now is promised by the end of 2010), and there's Browncoats:Redemption expected to have preview screenings this summer and at our own Phoenix Comicon... but what people really want are episodes. Well, don't expect to see the actors on screen any time soon, but here's the next best thing! 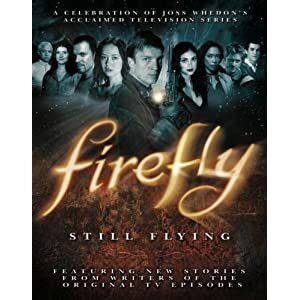 Firefly: Still Flying, due out next week on the 25th. Pre-order now on Amazon or stalk your favorite local retailer to make sure they carry it. Hit the jump for more information!